I’ve learned a lot over the past eight years of cooking and my palate has definitely become more refined, so today I’m using that new knowledge to give one of the first recipes I ever posted new life. 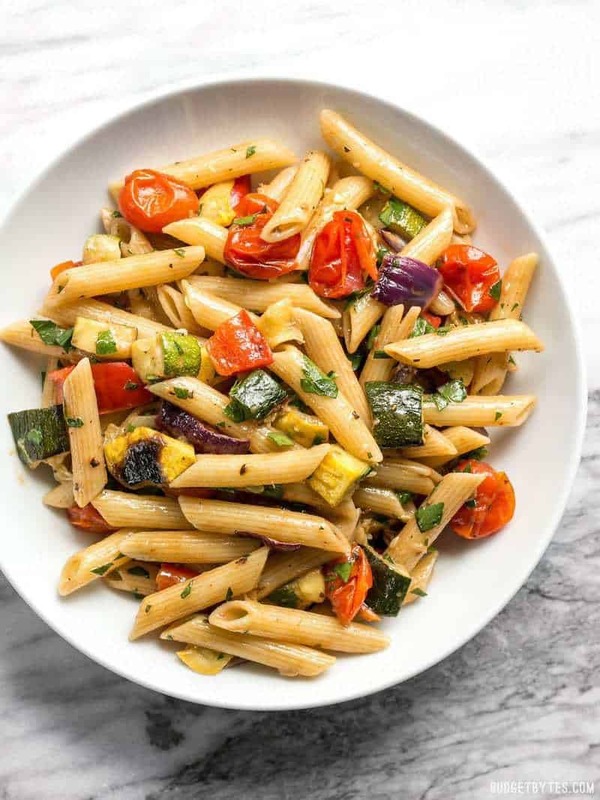 The original version of this Grilled Vegetable Pasta Salad was nothing more than just some grilled vegetables, pasta, and a bottled vinaigrette. 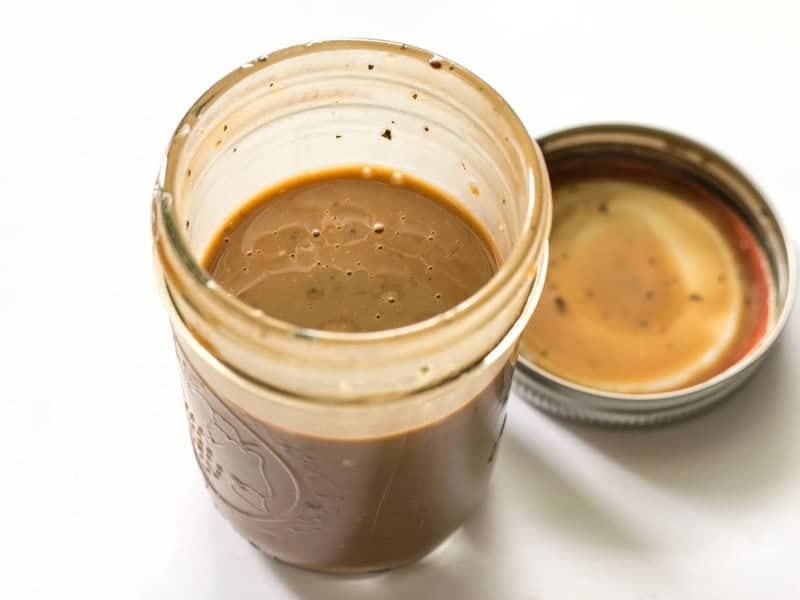 This time I gave it a little extra love by making my own creamy balsamic vinaigrette, and used an oven grilling technique (okay, maybe it’s just broiling) to make this recipe accessible for those of you who may not have an outdoor grill. I’m replacing the old recipe post with this new one, so if you are looking for the old recipe you can download it here. I love making big pasta salads to eat throughout the week and this Grilled Vegetable Pasta Salad holds up really well in the fridge. The flavor of the grilled vegetables deepens and permeates the pasta as it refrigerates making it even better the next day. The balsamic vinaigrette is definitely the most tangy the day of and it mellows out as it soaks into the pasta. 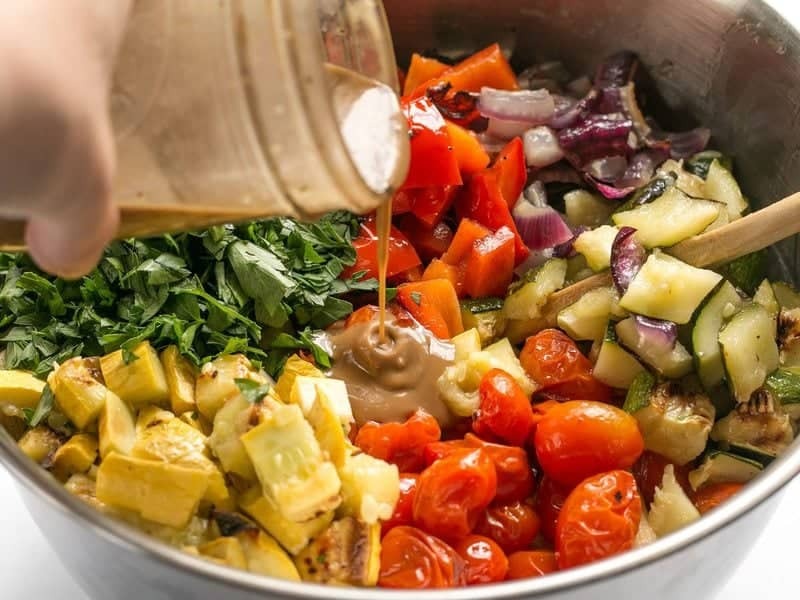 So if you prefer a really tangy dressing, add just enough dressing to coat everything right away to help keep the salad from drying out, but reserve at least half of the dressing to add just before serving (after refrigerating). It’s taken me a long time to come around to the benefits of salting the cooking water for pasta, and pasta salads helped change my mind on the subject. Because pasta is the bulk of the recipe, you really want to make sure it has good flavor on its own, and using salted cooking water makes a huge difference. Not sure where to start when salting your pasta cooking water? Here is a great tutorial on How to Properly Salt Your Pasta Water from Gimme Some Oven. 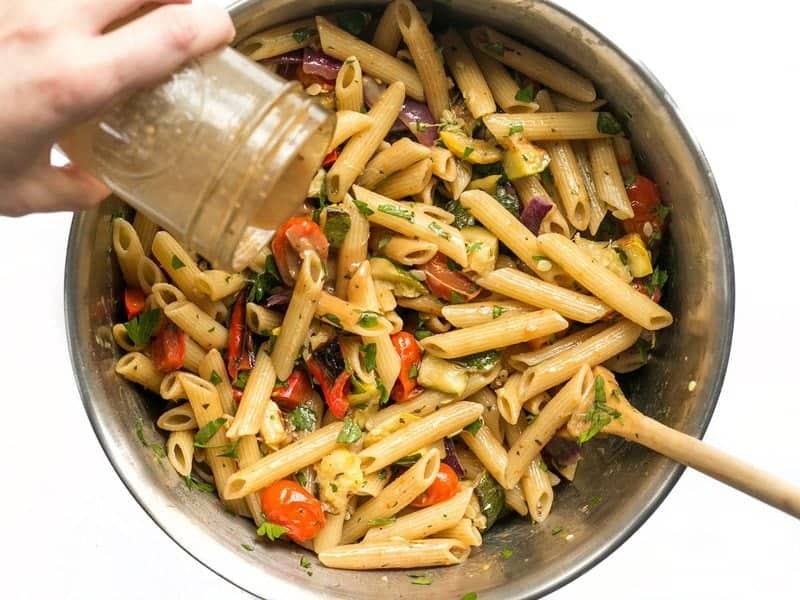 This classic summer Grilled Vegetable Pasta Salad features smoky fire licked vegetables and a homemade creamy balsamic vinaigrette. Grill the vegetables over an open flame until they are charred and tender. OR, adjust your oven's top rack to be about 6 inches below the broiler unit and turn the broiler on to high. Place the baking sheet under the broiler and watch it closely until the vegetable become charred and tender (about 10-15 minutes, depending on your oven and distance from the broiler). Allow the vegetables to cool slightly after grilling or broiling. Bring a large pot of salted water to a boil to cook the pasta. Once boiling, add the pasta and boil for 7-10 minutes, or just until the pasta is tender. Drain the pasta in a colander and allow it to cool slightly (until it's no longer steaming). *To make this recipe vegan, simply leave out the mayonnaise for a simple, non-creamy balsamic vinaigrette. **If you prefer a less tart dressing, try adding 1/2 tsp sugar or honey to help balance the balsamic vinegar. 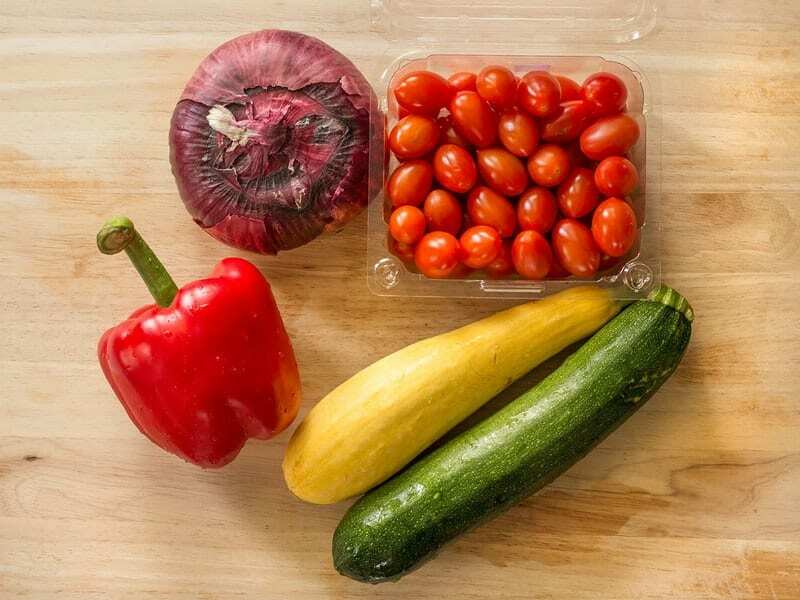 These are the vegetables I used for my salad: one zucchini, one yellow squash, one red bell pepper, 1 pint grape tomatoes and 1/2 of that red onion. I always like to try to get at least three colors, and always pick smaller vegetables than you think you need because once you slice them up you’ll have more than you expected. Remove the stems from the zucchini, squash, and red bell pepper, and remove the seed pod from the bell pepper. Slice the zucchini, squash, bell pepper, and red onion into thick slices (so they won’t fall through the slats on the grill. If you’re grilling the vegetables you can add the grape tomatoes to the salad fresh (slice them in half). If you’re using your oven’s broiler, you can broil them with the other vegetables so they burst and get a little charred as well. 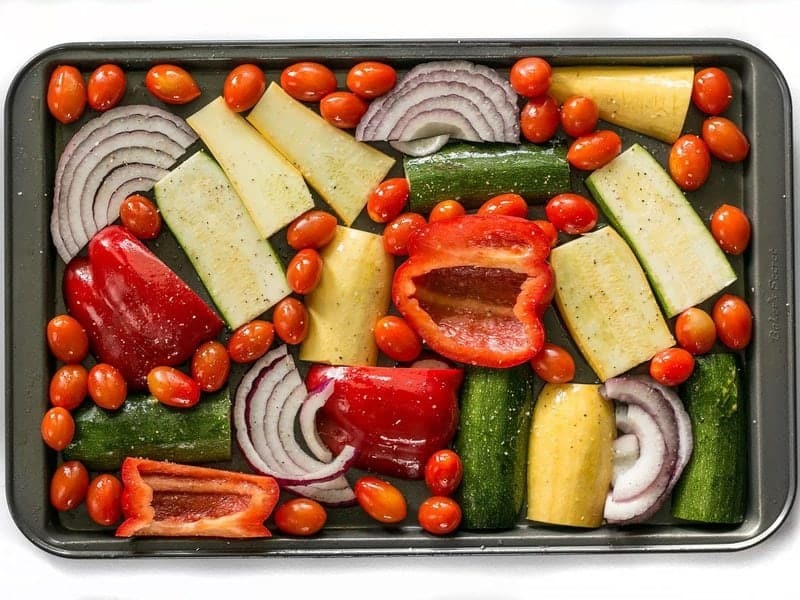 Place all the vegetables on a baking sheet, drizzle with 2 Tbsp of olive oil, and gently toss until the vegetables are WELL coated in oil. Then add a pinch of salt and pepper. 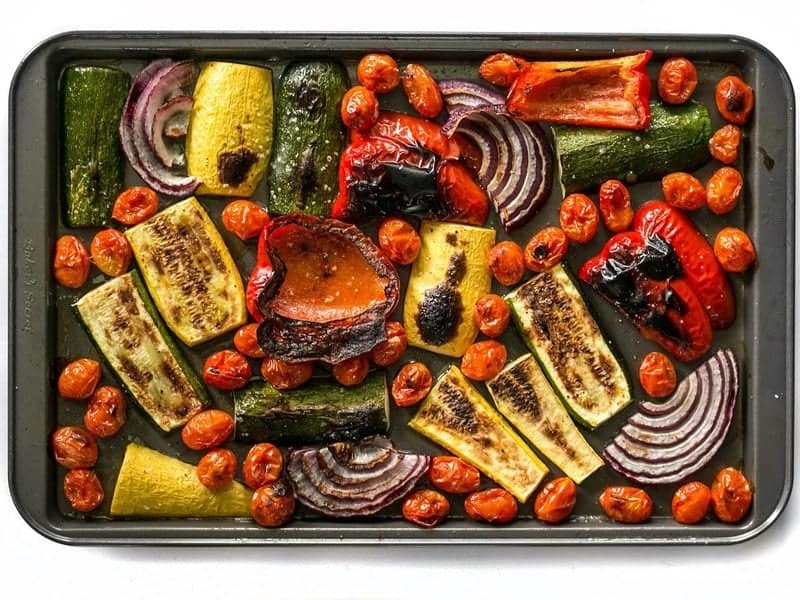 If you’re using a grill, grill the vegetables over direct flame until they are charred and tender (again, add the tomatoes fresh because they’re too small to go on the grill surface without falling through). If using your oven’s broiler, adjust the rack so that it’s six inches below the broiler unit. 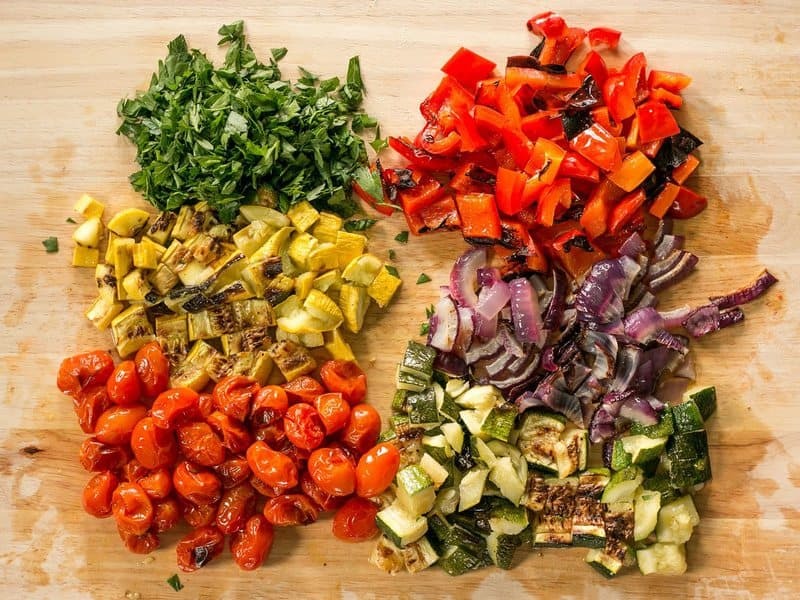 Turn the broiler on, place the baking sheet of vegetables under it, and watch it closely until the vegetables are charred and tender (10-15 minutes, depending on exactly how close they are to the heat). Let the vegetables cool. Bring a large pot of salted water to a boil for the pasta. Once boiling, add 1 lb. penne pasta, and continue to boil until the pasta is tender. Drain the pasta in a colander and let it cool. Meanwhile, make the creamy balsamic vinaigrette. In a jar or bowl combine 1/3 cup olive oil, 3 Tbsp balsamic vinegar, 2 Tbsp mayonnaise, 1/2 Tbsp Dijon mustard, 1 minced clove of garlic, 1/2 tsp dried basil, 1/2 tsp salt, and some freshly cracked pepper. Whisk the ingredients together or close the jar and shake until combined. Once the vegetables are cool enough to handle, chop them into 1-inch pieces. Roughly chop 1/4 bunch parsley. When the pasta is cooled to the point where it is no longer steaming, place it in a large bowl with the chopped vegetables and parsley. Add the creamy balsamic vinaigrette and gently stir until everything is coated. Start with half of the dressing and add more as needed (I used it all). 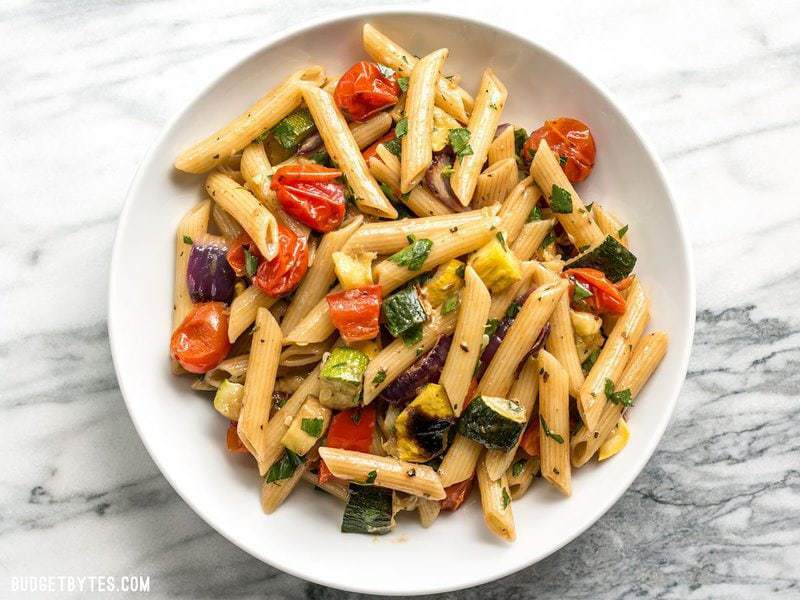 Serve the Grilled Vegetable Pasta Salad immediately or refrigerate until ready to eat. The dressing WILL absorb into the pasta and mellow out, so if you like a tangier dressing, wait to add some of the dressing right away to keep everything from drying out, but reserve some to add just before serving. This pasta salad was very yummy! I broiled my veggies instead of grilling, and chopped them small before broiling so they would cook faster. I had to add more dressing to the leftovers the next day, it got a little too dry for my liking. The dressing is amazing, and would be great on salads. I’m going to try leaving out the mayo the next time I make it, I think the dressing would still be good without it. This salad was fantastic! I grilled all my veg on the BBQ using a grill mat so they wouldn’t fall through the grates. I used asparagus, peppers (which I seared/roasted whole and then peeled and seeded) zucchini red onion, and mushroom. Dressing was really nice! I added feta cheese bc we love it! Made lots so we could have it all week! It held over so well. I happen to have some left over Roasted Summer Vegetables. Could I use them and add them to the cooked pasta and balsamic vinaigrette? Would I get a similar taste? Thank you! Wow! So good! My husband kept asking for seconds. This is the second time now I’ve made something to eat from your website. I love your recipes! I’ve made this countless times with whatever veggies are cheap in the store. Tastes great every time! I made this tonight with my boyfriend and it was SO good. We doubled everything and now have enough for a week’s worth of lunches! Thank you for the recipe! Hey Beth, I have made pasta previously but I want to know is there a particular reason that you grilled it first and then chopped it because I chop all the squashes and bell pepper and then grill it over the induction stove or oven, but is there a reason behind it. Do let me know so that next time when I cook Pasta I follow your method? The larger pieces are easier to grill because they won’t fall through the grate. :) If you’re doing it under the broiler, like I did, you can chop them first, but just watch them closely because the smaller pieces may broil faster. Have you tried this warm? Would I still make the dressing or do you think just a splash of olive at the end would suffice?